There are cake toppers that show elegance with crystals and pearls. You could personalize the cake topper with the couple's names or initials (monograms) or a silhouette of the couple. If you're the romantic type, select one that shows the bride and groom kissing or holding hands. For those with a great sense of humor, there are funny and humorous designs like a bride pulling the groom to the altar. You can even have your cake topper custom made to reflect the bride and groom. 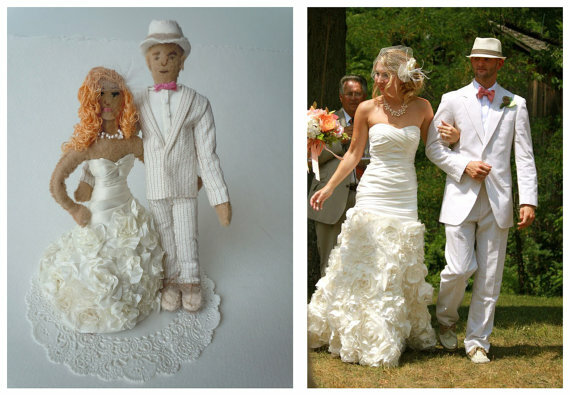 Whatever your personality and style, take time to choose and select a cake topper that is appropriate for your wedding. There are lots and lots of ideas out there, so get inspired with some of the great cake toppers below! 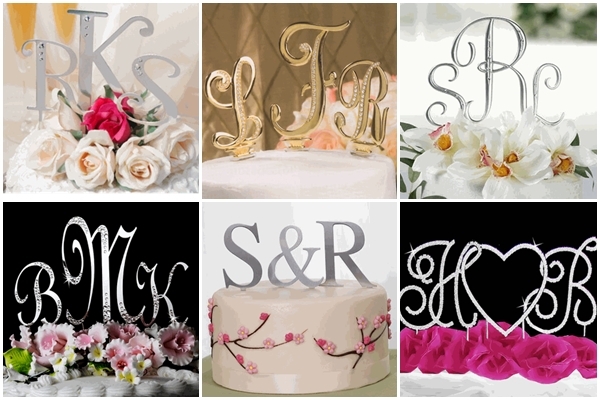 Have your wedding monogram or initials made into a cake topper or you can have the monogram put on the cake. Several online wedding shops have monogram cake toppers which you create online in the colors and font of your choice to coordinate with your wedding colors and/or theme. If you and your future spouse are lighthearted and have good sense of humor, you can choose a cake topper that show that on your cake. The options are endless! 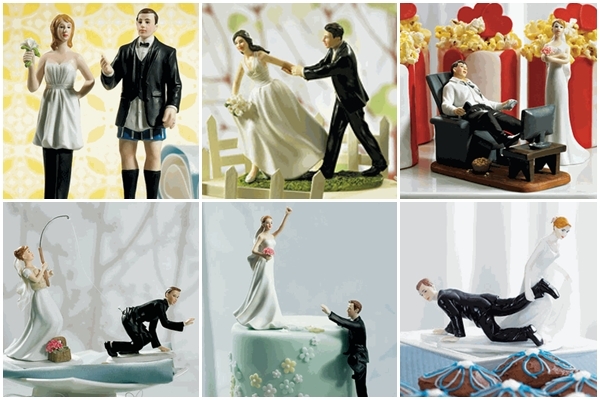 Some funny wedding cake toppers include a bride dragging a groom to the alter, catching him with a fishing pole, both wearing a ball and chain and more. You can usually find everything you need at the craft store and toy store. These type of cake toppers would make perfect groom’s cake toppers too. Do you have a shared hobby or sports team? Have fun with it with a sport or hobby cake topper! I've seen some weddings where couples have a UofL themed wedding and a UofL cake topper. 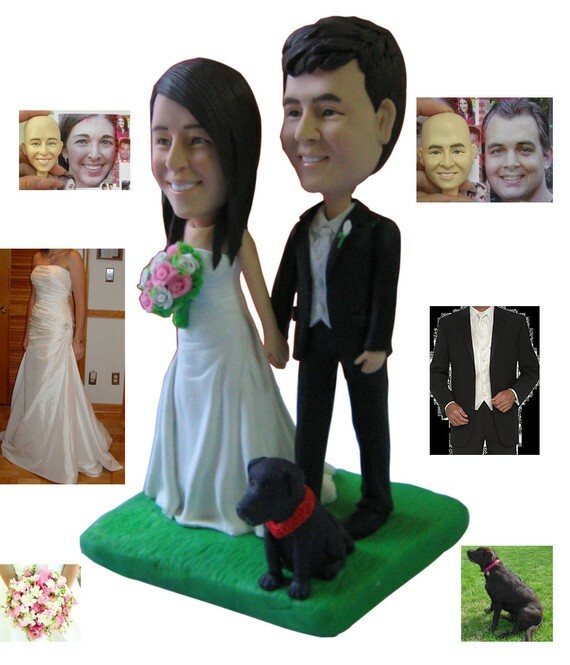 Several companies offer making personalized cake toppers. 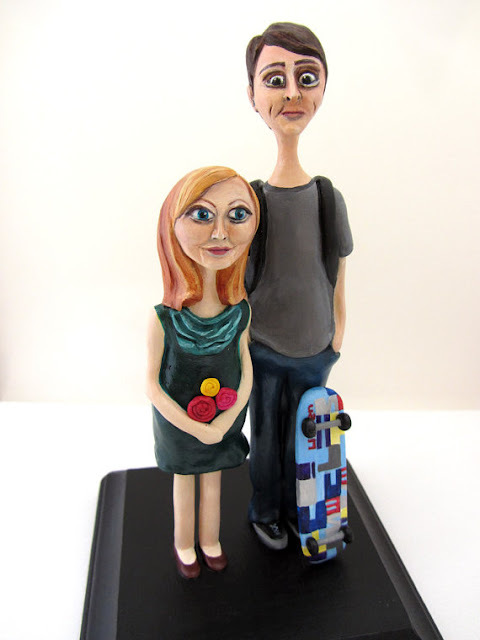 Just send in a photo of yourself and your future spouse and they'll create figurines that look exactly like the two of you. 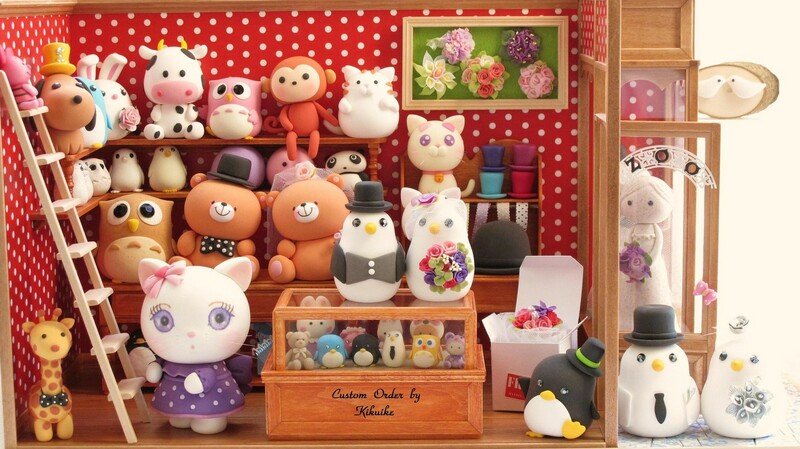 They're made of either modeling clay, plastic compounds or paper mache. These can be a bit pricey but they are truly unique. After your wedding day, you can display it at your home for the rest of your lives. Some couples plan on having a non traditional cake setup like cupcakes. 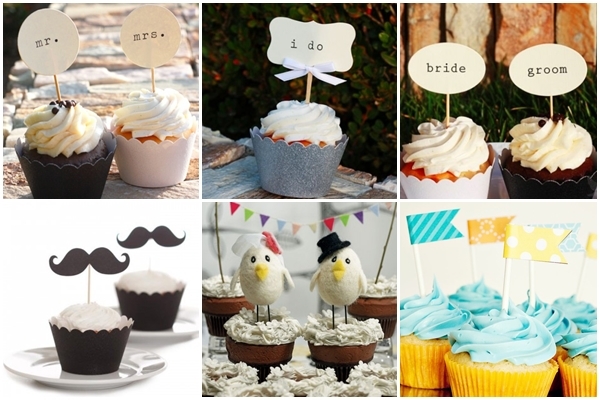 Like cakes, cupcakes are popular that you can also find cute cupcake toppers for a your wedding.